Publishers note: This article first appeared in the 2007 edition of the Raystown Lake Region/Huntingdon County Visitors Guide. The location of the eagles’ nest visible from the breast of the dam has changed, as the winter of 2010-2011 caused the dead tree supporting it to fall. The pair of eagles that built that nest is rebuilding in the same area. This tour is still our most popular driving tour from the Visitors Center. 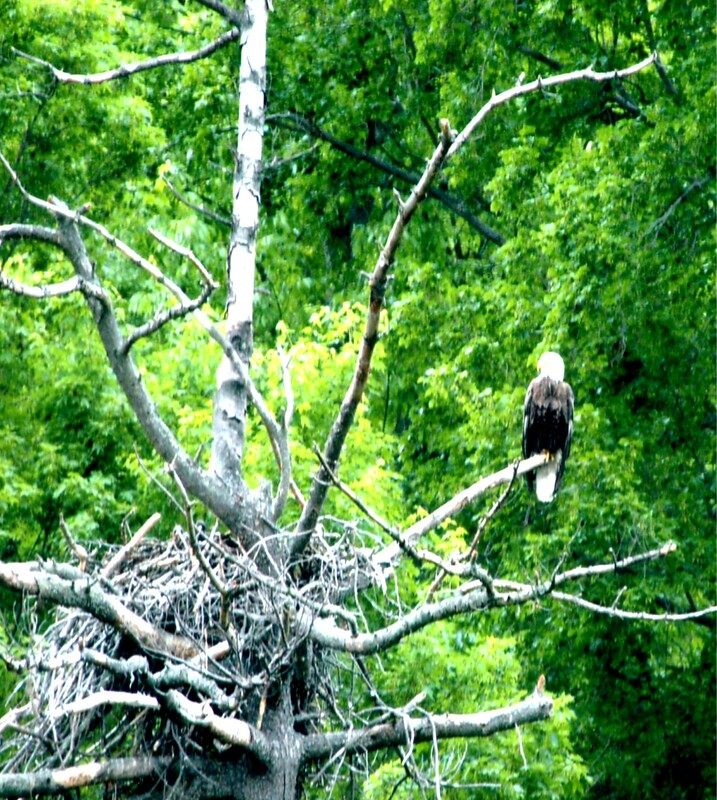 The Dam & Eagle Tour is a winning combination of scenic drive, vistas, catching a glimpse of our resident American Bald Eagles home, a short hike through 4 eco-systems and opportunities to picnic and kayak if you wish. Your adventure starts from the Raystown Lake Visitor Center and will last from 2-4 hours, depending upon how you design the trip for your group. Although my favorite time is first thing in the morning, the scenery and overlooks can be beautiful & romantic for a sunset tour. Traveling from the Visitors Center to Huntingdon via Piney Ridge Road is truly a scenic drive if you like mountain views, on the right you’ll see Terrace Mountain which parallels Raystown Lake; and to the left you’ll see Tussey Mountain, the towns of McConnellstown, Smithfield and eventually Huntingdon. The ‘ridge road’ has plenty of ‘S’ curves so take it easy, enjoy the view. When you begin to descend the mountain, again, use caution; see if you can guess which set of guard rails gets the most company by locals and visitors. Smithfield (US Rt 22) and Historic Huntingdon (access from 4th St) are your best bets for grabbing picnic food or arranging for a canoe/kayak delivery service should you choose to paddle the Raystown Branch of the Juniata River while on this tour. Once you turn onto Snyders Run Road, just follow the signage and cue sheet provided. Note: the gate to the overlooks is open 9AM to dusk from Mid April to Mid December, you are permitted to hike in, just please don’t block the gate. Take some time at the overlooks to observe the actual dam and an incredible mountain view beyond the dam a Ridenour Overlook. Once you’ve enjoyed this, you MUST walk the 300 yards to Hawn’s Overlook, this view was featured on the front cover of the PA Visitors Guide a few years back, it is one of the most photographed places in The Alleghenies. If you want to add romance to this tour, this is the place to be around sunset. You may want to come back to this spot again and again, it is just that magnificent. From the overlooks, drive a short distance to go over that dam structure you just saw at Ridenour. Once you go over the dam (thinking about how this earthen structure is holding back 8,300 acres of water) and park, look towards the mountain from which you just came (you can see the clearing at Ridenour overlook). With the dam on your right; find 7 while buoys close to the shoreline of the mountain. Count, from the dam, to the 2nd and 3rd buoy; between these two buoys, move your binoculars ¼ of the way up the mountain to see the nest. It is in a dead tree so you can see it even when foliage is full. Of course, in the spring, one of the pair is in or around the nest, after the eaglets fledge, you’ll see them more often below the dam. As you drive on Point Road parallel to the Raystown Branch of the Juniata River, be sure to have your eyes (unless you are the driver) glued to the opposite side of the river; between the dam and Corbin’s island, look for sycamore trees; the eagles often perch on the dead snag to fish below the dam. As an extra bonus, there is often our resident great blue heron in these waters as well. Options for other activities along Point Road are kayak/canoe/float trip, picnic, and a short nature trail. Corbin’s Island Recreation Area offers picnic tables and a ramp for those who may wish to float the Raystown Branch of the Juniata. This area also offers picnic tables and rest room facilities. According to the hiking professionals at the US Army Corp of Engineers, “The Riverside Nature Trail offers a rare opportunity to observe four distinct ecosystem communities during a hike of just ½ mile. You’ll return along the same path making a total journey of one mile through riverine, wetland, successional forest and open field ecosystems.” If you have children, you will want to pick up the trail map and have the kids complete the scavenger hunt; when complete bring to visitor center for a certificate of completion. For those who plan the float trip, you’ll find the PA Fish and Boat Commission ramp at “The Point”; continue on Point Road which will bring you back to Rt 22. After such a great day, time to think about lunch or dinner or shopping to finish out the day; make sure you have our ‘Where to Eat, Where to Shop” brochure which will describe all your opportunities.